There's a lot of controversy in Minneapolis over which bar invented the stuffed cheeseburger (aka the Juicy Lucy, aaka the Jucy Lucy). 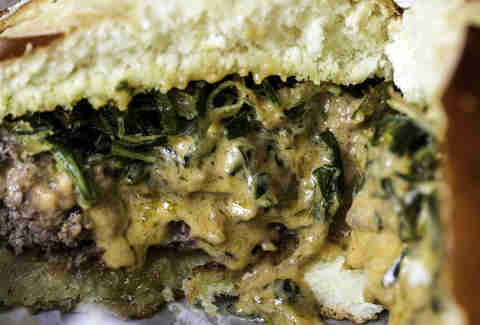 What we know for sure is that we Chicagoans don't need any extra dramasauce on our burgers, so here're 10 local spots to get a delicious stuffed burger without having to argue with someone who sounds like an extra in Fargo. 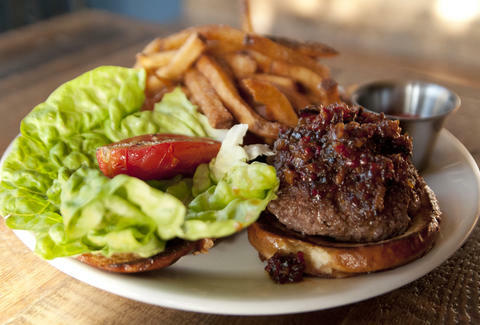 Marmalade isn’t the first thing that comes to mind when imagining a great burger, that is until you get a taste of the red onion/bacon marmalade on Dusek’s Juicy Lucy. The burger itself is Slagel Family Farm ground-beef topped with butter lettuce, heirloom tomato, and a house-baked pretzel bun. 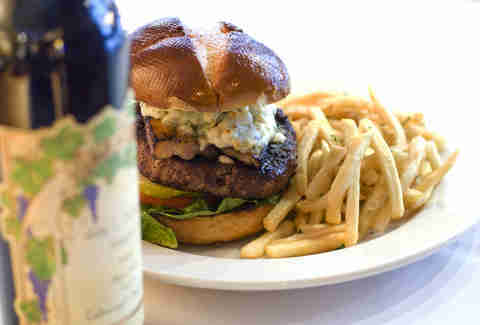 Oh, and it comes with a side of duck-fat fries. Vincenzo's is best known as a pizza joint, but their stuffed burger is everything a horizontally growing boy needs. 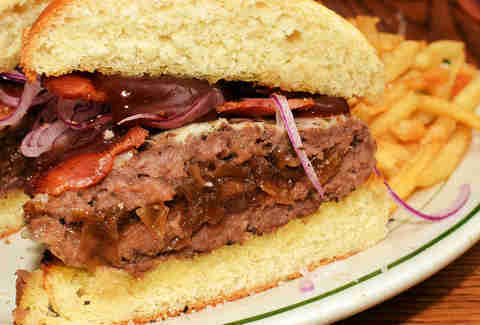 It’s a half-pound Angus patty packed with cheddar cheese and bacon, that's then smothered with chipotle BBQ sauce. You'll be rewarded for taking the risk of ordering a burger at a pizza place. The featured burger at this metal/jail-themed bar has a custom meat blend infused with bacon, leeks, garlic, and shallots that's stuffed with Merkts cheddar, plus topped with fried leeks and shallots with truffle oil. Choose your own adventure with a choice of mushroom, roasted peppers, bacon, bleu cheese, Swiss, cheddar, or American, and they’ll make you the master of your own ground-beef destiny. Leave the Derringer at home though; this isn’t that type of saloon. If Charlie is the Always Sunny gang’s wildcard, the Jucy Lucy is Bar Toma’s. You wouldn’t think of an Italian restaurant as a great place for a burger, but hidden on the lunch menu is the Bomba Burger. It’s a veal-and-beef patty stuffed with fiordilatte mozzarella. 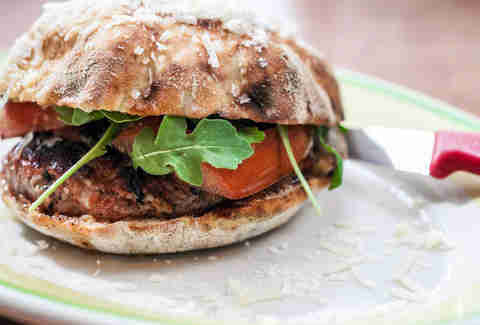 To keep things Italian, it’s sandwiched inside inflated pizza dough instead of a bun, and topped with seared Roma tomatoes and fresh arugula. Properly improper spelling goes a long way in our book, and so does brazen use of processed cheese. 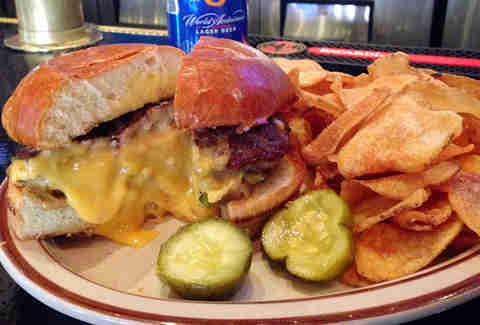 The Jucy Lucy is stuffed with our childhood favorite/the meltiest cheese on Earth, Velveeta, and then topped with caramelized onion and diced pickle. 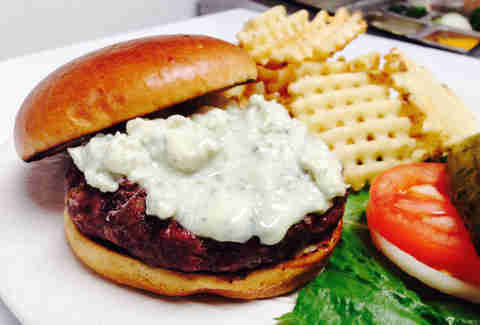 Throw in some waffle fries, and you have the perfect meal to accompany the Blackhawks game that's undoubtedly on all of the TVs. The list of stuffed burgers at this wrestling-themed bar is longer than a Ric Flair "WOOOOOOOOO", but the real test of strength is the Screamin’ Demon. 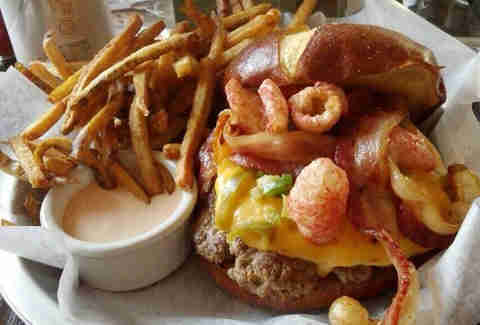 It’s stuffed with cheddar & fresh jalapeños, then topped with cheddar, pork rinds, pickled jalapeños, and Cholula aioli. It’s the Figure Four leg-lock for which your appetite has been waiting. Leaving the United Center after a game is a nightmare, so skip on traffic and walk less than a half-mile over for a PT Bacon Burger. It’s stuffed with bacon and blue cheese and topped with lettuce, onion, and marinated tomatoes. It might take two hands to eat, but it’s 100x better than cramming on a bus just to get somewhere you can find a cab. 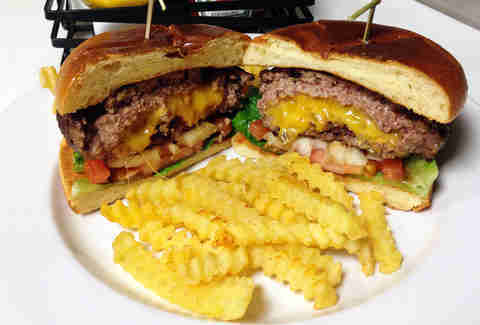 Hackney's takes their go-to burger and flips it inside out by stuffing it with bacon and cheddar cheese. 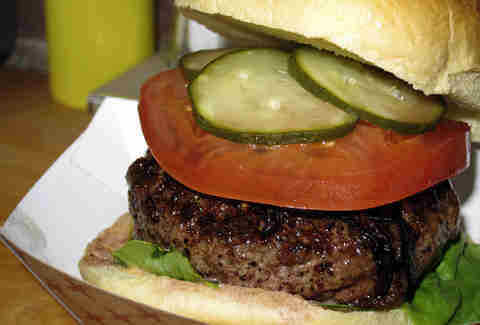 It’s topped with the standard lettuce, tomato, raw onion, and pickle, but we were sold the moment they said bacon. If you really want to get crazy, get it on rye bread. It’s 100% corn-fed, Midwestern prime beef stuffed with smoked Gouda, sautéed mushrooms, and caramelized onions, then topped with bacon, more cheese (Swiss), and smoky BBQ sauce all on pretzel bun. So basically, at least seven things you would eat on their own all packed into one delicious burger. Colin Joliat is a freelance food and booze writer who escaped from Flint, MI on the back of a rickety old produce truck. Follow him @FlintSkinny.